It looked so promising. I went into this draft, the third in a series of off-guild Return to Ravnica drafts, knowing that I had three guilds left in the tank: Simic and Dimir, neither of which I’ve ever heard of anyone drafting successfully in this set—and Orzhov, my personal favorite color combination, as well as a guild which I knew at least one big-name Magic player, Stanislav Cifka, the Eggs-piloting winner of last fall’s Pro Tour Seattle, has touted as a viable deck to draft. So into an RTR 4-3-2-2 on Magic Online I went. Pack one presented me with off-guild options including Centaur’s Herald (Simic), Tower Drake (Dimir), and Phantom General and Knightly Valor (Orzhov). I snapped up the Knightly Valor and never looked back. I followed up the Valor with a choice between Eyes in the Skies, Stab Wound, and Ethereal Armor. After passing the Phantom General I was loathe to pass the Eyes, but I couldn’t pass up a good removal spell. 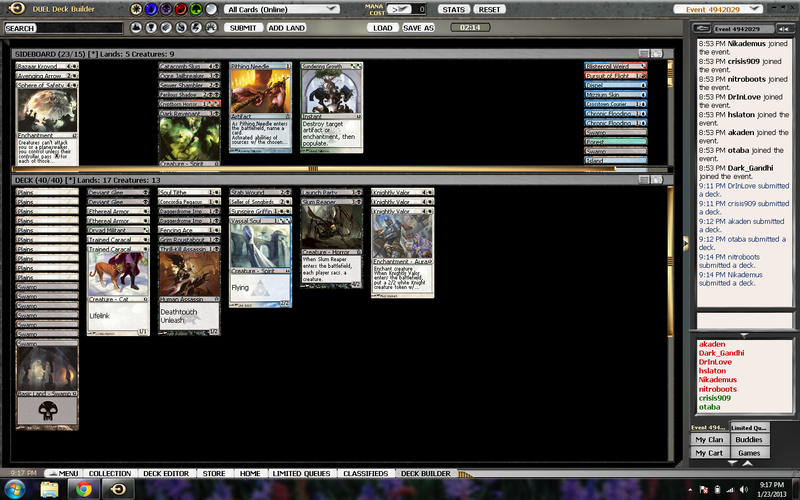 Third pick was a Sphere of Safety, which I’ve been wanting to run/try, especially in a BW deck, over a Daggerdrome Imp. Another Knightly Valor came around late, as did a pair of Trained Caracals (!) and a 14th-pick Launch Party. Pack two opened on a Lotleth Troll, which I checked the price on (just half a ticket) before glumly snagging a Seller of Songbirds over a Sewer Shambler. In retrospect, this wasn’t the right pick, as I ended up cutting the Seller—but the Shambler did wheel, as I figured it would. P2, P2 was Fencing Ace over what would have been my third K.V., a Grim Roustabout, and an Armory Guard. Next pick—BAM. I got my third K.V. A couple tough passings of Dead Revelers followed, but I finished pack two with a pair of Ethereal Armors, a pair of Deviant Glees, a Daggerdrome Imp, and a Thrill-Kill Assassin. The last pack opened on a somewhat weak pick, with a choice between Soul Tithe and Ethereal Armor. I took the Tithe, thinking that I needed removal, however sub-par. I was rewarded in pick two with a Slum Reaper—the centerpiece of any Orzhov deck, clearly, because no other deck seems to want them—and a stacked third pick where I had to choose between Ogre Jailbreaker, Azorius Arrester, Eyes in the Skies, Keening Apparation, and Vassal Soul. This was a tough pick, but I ended up choosing the Soul; I decided I needed evasive targets for my auras. I never did again see the Apparition, though, which would later come back to haunt me. I was, as they say, all in. And the precariousness of that position revealed itself quickly in round one. I won the roll, chose to play, and mulled a six-land hand. I kept a six-card hand—admittedly, somewhat loose—of Soul Tithe, 2X Plains, 2X Deviant Glee, and Daggerdrome Imp. I figured I could at a minimum Soul Tithe my opponent’s turn-two play. I got there, though, drawing a Swamp on T3, and started building up an army. Daggerdrome Imp was followed by a Caracal and an unleashed Roustabout, who on the next turn got Glee’d. My opponent promptly stopped the Roustabout with a Paralyzing Grip, and followed it up with a Runewing, which I regretfully Soul Tithed. I needed to get in there with my Imp. On her upkeep, my opp. let her Runewing die—and promptly played another. But my Glee’d Imp soon suited up with a topdecked Ethereal Armor, becoming a 6/5 first-striking lifelinker, in front of which the Runewing jumped. I made it to 32 life—dropping my opp. to ten life—before an incredibly painful Trostani’s Judgment on my Imp stopped my assault cold. Soon my opp. just vomited out her hand—Isperia’s Skywatch, Sunspire Griffin, New Prahv Guildmage, Tower Drake, Phantom General, and Concordia Pegasus—and I coudn’t find a way back into the game. Bummer. Between games I boarded out my Caracals, who’d spent the last few turns of G1 just sitting there looking dumb, and added Avenging Arrow and Sphere of Safety. I chose to play, and unfortunately had to mull yet again, this time another six-lander, but with Slum Reaper as my seventh card. Yeah, that’s a non-bo. I kept a not-much-better six of 2X Plains, 2X Swamp, Vassal Soul, and Launch Party. I played out the Soul after my opp.’s T2 Keening Apparition. Despite the Apparition, I dropped a Knightly Valor on my Soul. I guess I really didn’t have a plan at this point. All I had in hand at this point was a Slum Reaper, and I was facing a Tower Drake across the table. I knew my opp. could sac his Apparition at any time, shrinking my Soul to a 2/2, which would get eaten by the Drake (opp. had two untapped Plains with which to pump). It was disappointing, because I really thought this deck had some action. But my opp.’s horde of fliers just shut everything down. And in retrospect I reckon that Slum Reaper, which was one of my last plays of G2, is actually kind of a non-bo with the type of all-in deck I was trying to play. What can I say? I got blinded by the Reaper. 23/17 is a Hipsters of the Coast column focused on Limited play—primarily draft and sealed, but also cubing, 2HG, and anything else we can come up with. The name refers to the “Golden Ratio” of a Limited deck: 23 spells and 17 lands.